With the Winco PMCD-9U Burgundy Double Fold Menu Cover 9-1/2" x 12" you can display an array of menu selections to your guests in a clean, pristine manner. This menu cover has a burgundy double-stitched border with brass corners and features four high visibility vinyl panels that can highlight your menu choices. 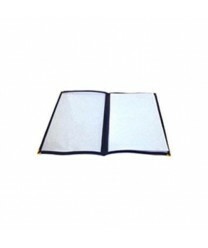 With a plastic protective menu cover you can easily design your own paper menus that can be changed as often as needed, without worrying about staining, tearing or becoming outdated.